Splice offers remote color session review! Can’t everyone do that now, you ask? Basically yes. So we are going a step further to partner with your production team. We will exploit our years of post-production experience to truly streamline and save you time and dollars. We will design a custom solution to integrate into your current post workflow whether you are using Avid, FCPX or Premiere. We come onsite to calibrate monitors and integrate systems and often help clients find other post efficiencies as part of our process. While we focus on remote color review, our real-time streaming option can be used for review of any of our post services including visual effects, motion design and sound. Anywhere! We want to put real-time review as close to the decision makers as possible to save you time and stretch your budget. You can supervise our senior colorists from your edit suite, at your production office, onset or at your desk. Splice Remote Color puts the session where the creative decisions get made saving travel time at competitive rates! Why not? Budgets continue to tighten with greater expectations for quality and turnaround time. Why fight traffic if you can get the job done better, faster and cheaper? One of our certified calibration engineers will come to your location to setup professional and accurate monitoring that matches perfectly to what our colorist sees. We will create a streamlined workflow that supports your post process from a traditional remote DaVinci Resolve rig that is integrated into your post workflow or a simple single-switch live feed connected directly to our color bay. Edit your show or film in any software. Export a QuickTime or Avid movie file along with an XML or EDL. We create a Resolve session and insert cut markers. We connect to and control your Resolve system. Connect over Skype puts you “in the bay” making creative decisions in real-time. As our colorist creates grades, your system updates in real-time on your matching monitor. Project settings are on both systems so you can disconnect and export the graded version directly from your Resolve. Make small tweaks on your own or call us with revisions. If time allows us to share all your media, we can add a couple steps that will offer other options and flexibility like having the ability to color before you lock picture allowing your creative team to try different looks and present better looking approval cuts. We will work with your team to figure out what makes sense for your project. 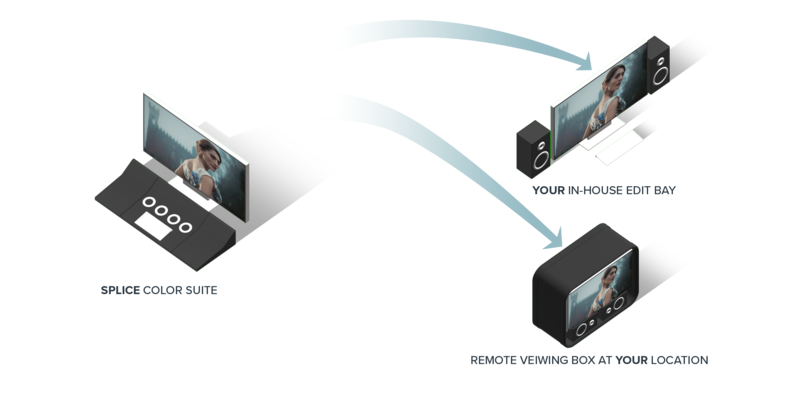 We also offer a simpler single-switch, high-resolution, real-time streaming service if you do not have a Resolve system or don’t want to deal with the technology. Michael has honed his craft over 12 years coloring for broadcast television, digital cinema, commercial and social media. His experience has included a wide variety of television, feature, corporate and short-form programming. Recent credits include ABC's docudrama In An Instant 20/20, American Film Institute feature documentary Saving Brinton, History Channel's America Unearthed and Travel Channel's Myth or Monster. Feature credits include Momentum Films' Voice From the Stone starring Game of Thrones' Emilia Clark. Nick is a 12-year industry veteran. He spent the early part of his career on set working with top-level directors and cinematographers and later transitioned to post production color, online and dailies for features including Fox Searchlight’s Wilson starring Woody Harrelson. He has since graded award winning films featured around the world from Sundance to Cannes. Nick loves music videos and experimental films and is currently working on a hand full of broadcast spots that will premiere during Super Bowl LII.